This is the third article in a series about house measuring. In the first article in this 3-part series, (Determining the Square Footage of a House – Part 1 of 3), we discussed the most basic aspects of house measuring. We covered measuring a house that is a simple rectangle without a garage, and illustrated the difference a slight variation in the length of one wall might make when calculating square footage. In article 2 (Square Footage of a House – Part 2 of 3) we reviewed how to measure a house that is slightly more complicated than a basic rectangle. We also showed how to calculate the square footage of a house that is a rectangle plus an additional space. At the bottom of that article, we listed property attributes (oooh – property properties!) that are or are not considered to be square footage for the purposes of an appraisal (i.e., basements, other spaces such as a storage closet in a garage). We also discussed attributes that may not necessarily contribute square footage but may still contribute value – which is not the same thing. We’ve been getting a lot of call this summer – 2018 – requesting our house measuring service in Austin and the surrounding communities.. 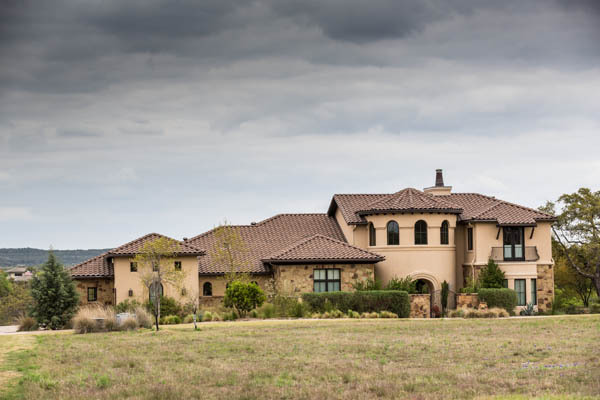 Larger houses, and houses outside of Travis County are more, but not much more, usually $150. Sometimes we need to add a small trip fee. In case you’re wondering, the typical call we receive about our house measuring service is when a house is about to be listed for sale. If you have any doubt at all about the size of your home, it is far, far better to have it measured in advance than to have the sales contract fall apart over the actual (vs. advertised) size. Even small houses should be measured professionally prior to listing. If you (or your client, if you’re a real estate sales professional). It becomes even more critical as the size of the home increases – builder sizes are almost always wrong, often by several hundred square feet. Take a look at this photo and consider what it takes for measuring this house! If you are the seller and the buyer’s appraisal shows a significant difference from the advertised size vs. the actual size, you’re probably going to be back at the negotiating table. Oh, the stress! Now, back to our regularly scheduled programming – house measuring, explained by the pros. In this post, we’ll talk about measuring more complicated houses, including 2-story houses with and without great rooms (vaulted spaces). A house measuring sketch with a curved staircase. If you read the first article in this series, you understand the basics of simple house measuring. By now you may be squawking about when we’re going to get to the good stuff. Well, right about now. The easiest 2-story house to measure is the one where the second story has the exact same footprint as the first story – you can tell this by just looking at the outside and the inside. In this case, the size of the second story is the same as the first (which you measure from the outside), minus the open spaces. An open space is the space that you can’t actually walk on – like the open area at the top of a staircase, or the open space above a great room with a high ceiling. It can be tricky to figure out how to measure these spaces, even in this simple example. For the open space at the top of the staircase, study it until you figure out spots from which you can measure, and draw it out on a piece of paper as you measure. Calculate the size of this space and subtract it from the size you started with as your second story calculated size (remember – in this example the second story is the same size as the first story, which you already figured out). You can do the same with the open space above a great room or a vaulted space. You may have to measure the space of the great room, below the vaulted space on the first floor, or get creative to figure out how to cancel out this space. An important thing to remember is that open spaces above other living spaces (like vaulted ceilings) are not counted as square footage for the home. A medium-difficulty house measuring sketch. Frequently, the second story of a home does not have the same footprint as the first story. These houses often do not have second floors that are easy to measure. These are the ones that when you drive up to them, you see interesting roof lines, dormers, turrets, or other spaces on the second story that aren’t going to be easy to measure. We take another swig of coffee and call home to say we’ll be late for dinner! Second stories that are not the same footprint as the first floor are measured from the inside. Or, some measurements are taken from the outside, then adjusted based on interior measurements. Remember that when we measured the first floor, we measured from the outside. In order to compensate for measuring the second story from the inside, we need to add an incremental amount to compensate for the thickness of the exterior and interior walls. The amount we add depends on what is on the exterior of the second story – masonry, stone, hardiplank, etc. This amount averages about .85 feet, or 10.2 inches, if the space ends at an exterior wall, and about .46 feet if it ends at an attic space. Make sure to add the right amount to both ends of your measurement. Ah, another point of interest – although regular measuring tapes uses inches and feet, appraisers measure spaces in tenths of a foot. Whenever possible, we use a laser measuring device to ensure that our measurements are as accurate as possible. You will need to make a careful diagram, and mark your measurements as you go. If it doesn’t seem to be adding up, re-measure until you’re sure you have it right. You may need someone else to hold the other end of the tape to keep it level and to keep it from sagging. 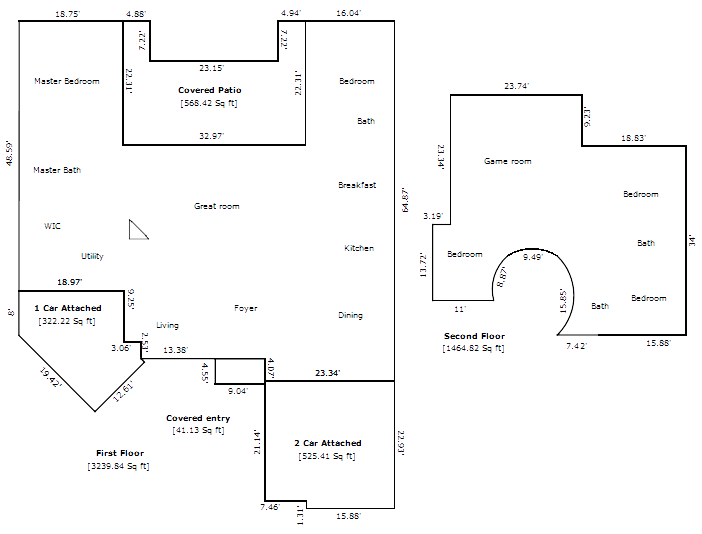 A more complicated floor plan created from our house measuring service. From here on out, unless you really really like geometry, you will get the best results by using specialized software to calculate the size of a house that you measure. Unless you can easily break the footprint of the house up into squares, rectangles and right-angle triangles, it gets complicated and tedious, fast. 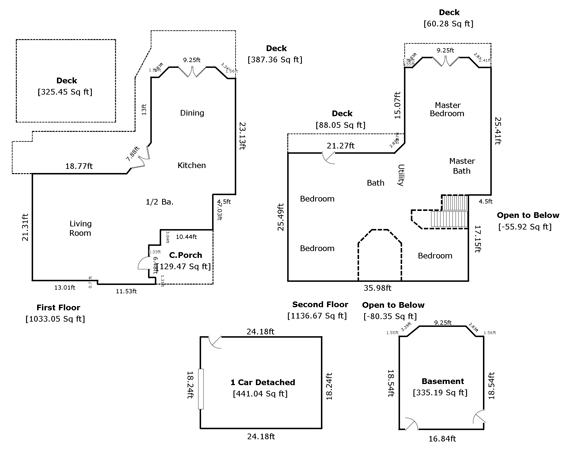 We hope you learned something from this series of articles on how to measure a house. If we missed something, please comment below and we’ll try to address your questions. 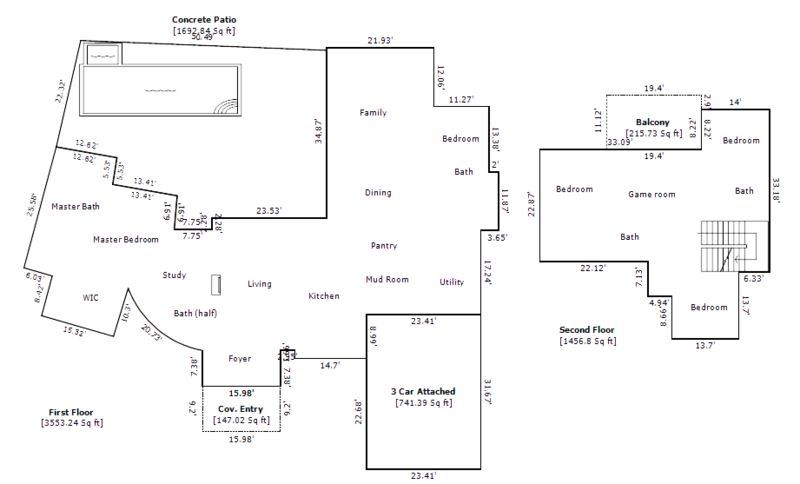 Thank you for placing this great information about measuring square footage on the web. I will be using this in my business to help better calculate the actual size of a structure.